Checked the website and I didn't find anything on how they are wired. A Cub switches the voltage level on a single circuit to "dim" the lights, while most cars with hi-lo use a separate circuit for high and low, remember the three prong connector on the back of the old sealed beam lights? I would avoid the high/low. Like Scrivet said, the wiring is different. The Cub uses a resistance coil to reduce the voltage, so at "low" that coil gets hot and in doing so it probably uses the same amount of draw as full beam. I make up a #10 or heavier copper wire loop and replace the heating coil and just run the lights on or off. Especially if you have an alternator conversion (like I do) and LEDs (coming soon) when there is an embarrassment of riches when it comes to amperage. When you only have 9 horsepower you need to know the names of all of the ponies! The Cub's light switch dims the lights via a resistor, which is tuned to the Amp draw of three incandescent bulbs. Since the LEDs draw far fewer Amps, the resistor won't have the same effect. I don't think it will have any effect. I never understood the purpose of the dim lights anyway. My burps emit more light. You can't see them and they really don't help others see you. 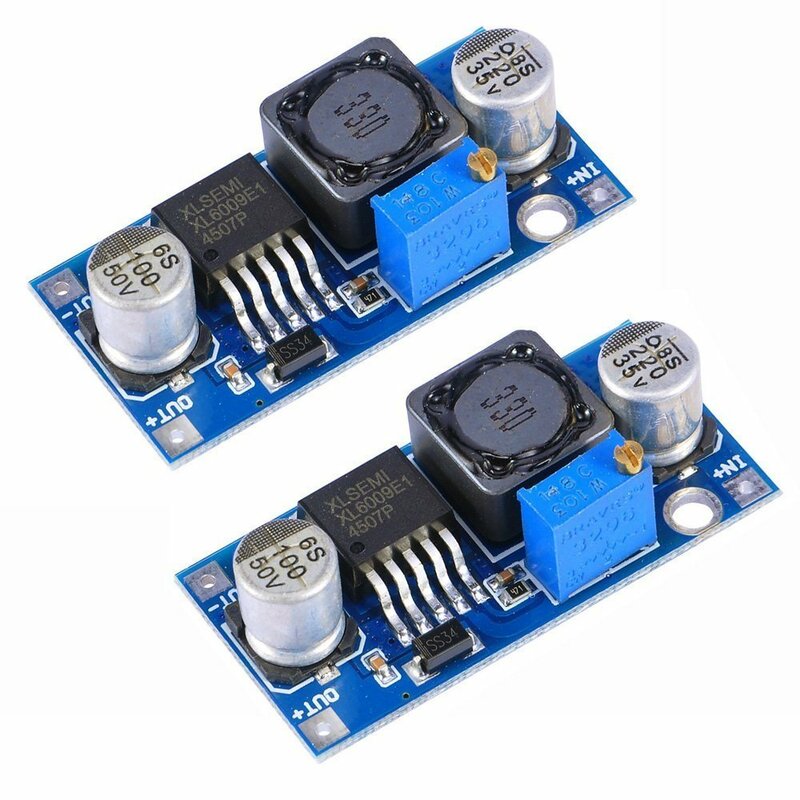 I just ordered a pair of these boost converters so that I can use the Larsen 12V LED sealed beam on my 6V Cub. These are pretty small and I think I can stuff them into the headlight housings (I have the larger housings - not the pancake). After soldering to the boards, I'll encase them in large heat-shrink tubing to prevent shorts. Next up is to order a pair of trapezoidal PAR-36 LED sealed beams from Larsen. steiner is selling par 36 sealed beam that they say are good for 6 and 12 volt. i have not tried them. i have used the larsens and are very happy but they do not work at 6 volt. they turn off at just under 8 volt. good luck. the units you listed do not mention positive ground. there are units out there that concert 6 v possitive ground to 12 neg to add a modern circuit to classic cars. you may have think out the wiring to get the led to work with that modual. the larsens will not work wired backward. leds have to say " polariry independenant " to work like an incandesenct bulb. and not all have that feature. Last edited by inairam on Tue Jul 25, 2017 8:09 am, edited 2 times in total. inairam wrote: i have used the larsens and are very happy but they do not work at 6 volt. they turn off at just under 8 volt. good luck. Yep, that's why I'm going to try this converter set to 6V in and 12V out. I'll report back on how it works out and take a few pictures in the process. This is the only Step up Converter Regulator I found that specifically says positive to negative ground. I am interested in what you find with your unit. The converters that Urbish has found don't appear to have a chassis ground of their own. So they will be isolated and not care which way the tractor is grounded. By the way, the Larsen lights claim to work up to 30 volts. It looks like these converters are limited to 4 amps input. With 6 volts, that limits wattage at 24. You should be able to set the output voltage some above 12 volts and get a little more light without straining anything. I'd maybe try for a voltage that draws about 3.5 amps on the input side. Jim Becker wrote: The converters that Urbish has found don't appear to have a chassis ground of their own. So they will be isolated and not care which way the tractor is grounded. By the way, the Larsen lights claim to work up to 30 volts. It looks like these converters are limited to 4 amps input. With 6 volts, that limits wattage at 24. You should be able to set the output voltage some above 12 volts and get a little more light without straining anything. I'd maybe try for a voltage that draws about 3.5 amps on the input side. Yep, the converters I found have adjustable output voltage (little brass screw on the blue box) and are targeted toward hobbyists and robot builders. We use them at work for custom electromechanical devices. The ones you found, inairam, and marketed for car audio in 6V positive ground vehicles. I imagine that the ones you found are much more rugged, but at 1/8th the cost, I'll see if the cheap ones will fly. Jim Becker is right-on in that I'll dial up the voltage until I get just under the rated input current to get max intensity of the LEDs. Given the info available on the boost converter, I should be able to push about 1.2A out at 12V. This equals 14.4W. The lights are rated at 13W, so they should be drawing slightly less current than the converter can push at 12V. I'll set this up at work with a variable power supply first so I can easily measure how much current is going in vs. how much is going out variety of different output voltages. assume 2 x that on the input 1.5 say 2 or 2.34 the rated amps in per light. the standard sealed beam are 3-5 amps each at 12 and 6 volts respectivly. the higher the output voltage the lower the draw for the same power. it would be a good idea to develop a table of output voltage vs input current for the lights. and try for find a sweet spot/balance. I may be willing to lend my light test chamber to such a noble effort. Larsen may have such a table of at least voltage vs current vs light out. we do not know if the light output is linuar as voltage increases. the light did have different output with my test rig at the different current settings for the same voltage. Last edited by inairam on Tue Jul 25, 2017 12:01 pm, edited 1 time in total. Yeah, I'm just going to experiment to see what the converter will push, but probably dial it back so that I'm still getting good light with the lowest current draw from the 6V system before I install on the tractor. If I can't fit the converters in the headlight housings, I'll 3D print weather-tight enclosures for them and install somewhere under the hood. Headlights and boost converters arrived today. Will play with these at work tomorrow. The converter is definitely small enough to fit in the headlight housing. I got these wired these up in the lab this morning. The bulbs draw 1.1A/each at 12VDC. I set the power supply at 6VDC and adjusted the boost converter output voltage to 12VDC. When running, the input current is 2.73A, making the converter about 81% efficient with this setup. Dialing the boost converter to a higher output voltage didn't seem to have any effect on the light intensity. That said, at 12VDC these are very bright. I haven't measured the current draw on the original 6VDC incandescent bulb, but I figure it is slightly higher. So in the end I'll be drawing a little less current, and will have WAY more light. A side note: The boost converter gets pretty hot (designed to do so). I won't be encasing it in large shrink tubing per my original plan. I'll have to figure out a way to mount it within the housing so that it won't short out, but can shed heat. I'll see how much heat is generated between the boost converter and the bulb combined. This may lead to me mounting the boost converter outside the headlight housing.